Polycom's Realpresence Trio offers a voice, video and content sharing device designed for the huddle room, says Gail Holt, MD of Hardware.com. 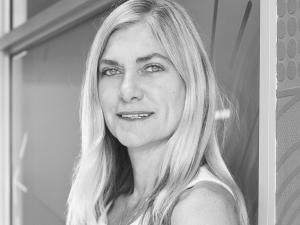 Gail Holt, MD of Hardware.com. Huddle rooms are defined as meeting rooms that can only accommodate a small number of people (typically up to six). However, what equipment is in the room and what the room is used for is still undecided. Some suggest the huddle room is equipped with audio and video technology. Others say the room has no AV component, but merely a flip-chart or whiteboard. "Either way, these rooms are used by groups who want to get together for impromptu, or previously scheduled, meetings to share ideas, content and possibly a quick, informal video conference," says Gail Holt, MD of Polycom distributor, Hardware.com. For many companies, the days of large conference rooms for meetings and videoconferencing are dwindling, while smaller "quick" meeting rooms are on the rise. It is estimated that there are approximately 20-25 huddle rooms for every group video room. So why are companies trending towards these small, insulated collaboration spaces rather than the large presentation rooms we have grown accustomed to? "Most modern businesses have open plan offices, and this is one of the reasons huddle rooms have taken off. People need a private, quiet place to meet, discuss and share," continues Holt. An increasing amount of employees are working remotely, from home, a few days each week. Employees are travelling more often and working varied hours. Fewer employees are in the office during the typical 8am-5pm hours, and because of that, designated spaces like offices are unnecessary. Open floor plans allow for large spaces to be occupied by cubicles and desks, rather than wasting private spaces reserved for employees that only use their offices a percentage of the time. When these remote and travelling workers are in the building, huddle rooms serve in place of the offices that once went unused. When they are away, huddle rooms are available to all employees. A huddle room can be used to give presentations to an individual or small group in a quiet, enclosed space. Meetings, brainstorming sessions, and presentations for groups of two to four employees are perfect for huddle rooms. If employees need to meet with prospective clients or members of their team, a huddle room is as available as an office would be. There is an increase in the amount of small one-man offices throughout the country, which need to have daily or weekly contact with their head office. When remote employees need to video conference in to the office, a huddle room allows for a private space to speak. "Large boardrooms, which are often fitted out with expensive video conferencing facilities, are frequently under-utilised. How often does it happen that two or three people are in the boardroom using this space that is large enough to accommodate 20 people! Meanwhile, two other groups can't meet to collaborate until the first has finished. "You can fit approximately four huddle rooms in the space of a one large corporate boardroom, which leads to far greater productivity and more meeting spaces," Holt adds. With huddle rooms, the first group is in an enclosed space, their ideas unheard by any but those in the room. The second group is able to view a presentation given by someone from their notebook or mobile device. The third sits comfortably around a table, while the remote employee's video displays on a screen built into the wall, an equal and active member of the team. In each instance, the groups are offered an intimate and private space. Huddle rooms give companies availability, and that availability allows for increased workflow as employees don't need to plan around one another's schedules or fight over time in the corporate boardroom. So, what is in a huddle room? A typical huddle room has only basic furniture; a small table and chairs and perhaps a telephone on the desk to enable a voice conference. It might also have a whiteboard or flip-chart to allow for quick idea sharing and presentation. A small percentage of huddle rooms include a flat-screen monitor mounted on the wall and an HDMI cable to allow people to present from their notebooks. Huddle rooms provide a quick way to share content. A projector or video screen can provide a means to share presentations to a small group of colleagues or clients within the confines of a huddle room. Finally, a mounted camera and speakers can allow for videoconferencing with other remote employees or clients. With huddle rooms becoming more prevalent in offices, where does that leave conference rooms in the future? Practically, conference rooms need to be available for large meetings and presentations; however, any collaboration equipment installed is a very expensive investment. The huddle room is not going to take over the corporate boardroom. However, the need for collaboration and content sharing will demand that audio visual technology be installed in these meeting rooms. 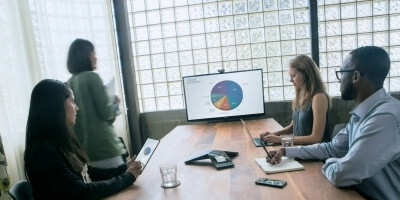 "Due to the high cost, audio visual has been limited to the boardroom; however, Polycom's Realpresence Trio offers a voice, video and content sharing standalone device actually designed for the huddle room. It enables employees to collaborate via voice, video or both and share data and presentations. The Trio provides an awesome user experience, and offers HD quality on both video and voice. It is easy to install and is available at an extremely low price point. It's affordable and increases productivity and communication; every huddle room should have one," concludes Holt. Hardware.com is an official Polycom distributor and supplies the complete range of Polycom voice solutions for SIP platforms and Skype for Business/O365, including the RealPresence Trio. All products are fully supported by their comprehensive portfolio of professional services. These services are designed to assist clients throughout every stage of a project and are fully tailored to suit the organisations' requirements. Services include supply of demonstration and POC equipment, installation and pre-configuration, technical and support training, onsite technical support and assistance, onsite end-user training (both on the handset and the SfB client), as well as second tier support contracts.